As a wedding planner, you know how hard it is to rise above the competition. This career is unlike any other in the wedding industry. Photographers can easily show people their Instagram, and couples can taste a baker's cake. It's harder to prove a planner's abilities when potential clients can't experience your weddings firsthand. Pictures of your past weddings will only show so much to your potential brides and grooms. That's why bringing your company to a wedding expo event is crucial for building your client list. With a trade show booth, you can have them experience a bit of what you have to offer. But, if you want your booth to be worth all the time and money, you have to bring it! Trying to gain attention at any expo can be a challenge. You want to make sure you stand out. Here are 5 trade show booth ideas that will be sure to turn heads. Many wedding planners tend to set up a table and chair for their trade show booth. They put up some poster board with pictures of their events. Then they just take a seat behind their table and wait for people to come to them. Sure, working an expo makes for a long and tiring day. But so is working a wedding! Stay on your feet meeting potential clients instead of hiding behind a table. Doing a standard table set up shows very little creativity. Of course, you can still have tables. They do serve a practical purpose! But, one idea is to use high top tables that clients can stand around while they chat with you. Or you can create more of a lounge vibe and put your business cards on a coffee table. Within your little cube of space, you can do so many exciting things. Remember that your own imagination is the limit (well, fire safety laws and convention center rules might limit you a little too). 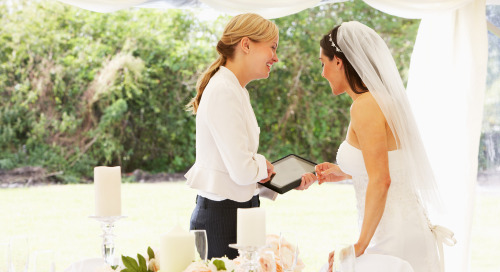 As a wedding planner, you're not just selling your events. You're also selling yourself. You'll be spending the better part of the year communicating back and forth with a couple. People want to work with someone that they like and can get along with. That's why creating a positive impression on a potential client at an expo is so important. The problem is that it's hard to get enough face time to create that connection. Many people will just stop to look at your booth for a moment and then move on. That's why your booth should give people a reason to stay and chat with you for a bit. One way to do that is to have some kind of activity station. This is a great opportunity to join forces with a business you're not in competition with. One possibility is to have a makeup artist do 5-minute makeovers. You can split the cost of the booth with the other person. They can promote their services while they do their makeup. Meanwhile, you chat people up while they're waiting to go next. Creating a photo opportunity is a great idea for two reasons. One, people love to take photos so this will draw people to your booth. It can also serve as some self-promotion that will last after the expo is over. You can encourage people to post their photos to their Instagram and have them use your company hashtag. How can you turn your trade show booth into an amateur photoshoot? Create a background that's bright and fun. Use different textures and materials like balloons, flowers, and streamers. Even if you don't have much space, you can make a selfie station. Set up a ring light and a smaller background. Be sure to prominently display your hashtag where people won't miss it! Generally, you can't bring potential clients to the weddings you plan. Why not bring the wedding to them instead? Use your space at an expo to create your own little transportive wedding. That could be the ceremony, cocktail hour, dinner, dancing, anything! Dress your booth from top to bottom. If you want to create a cocktail hour, set up a standing table. Hand out creative and beautiful mocktails. When they step into your booth, they'll feel like they're at the dream wedding they want you to plan for them. Everybody loves free stuff, which is why it's an easy way to entice people to visit your booth. A great idea is to make your party favors eye-catching. Something that will make other expo-goers ask each other, "where did you get that?" That means something that isn't so small that they can throw it in a tote bag. You could make a tote bag that they'll throw all of their other free stuff in! This could also be another opportunity to collaborate with a vendor. Give out finger foods from a catering company you often work with. People love free food as much as they love free stuff! These Trade Show Booth Ideas Will Make You Stand Out! With a little ingenuity, you can take these trade show booth ideas and turn them into something truly eye-catching! When couples see what you can do with such a small space, they'll be dying to have you work your magic at their wedding. Are you looking to learn more about being a successful wedding planner? Then come join us for Event Planner Expo 2019! We have an amazing lineup of speakers that will provide you with all the tips and inspiration you're looking for.